London mayor Sadiq Khan has signalled his support for a legal challenge to the expansion of Heathrow airport. 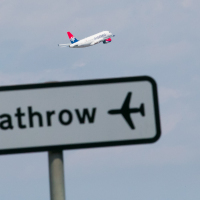 The London Mayor has directed Transport for London (TfL) to provide its "expert advice" to boroughs which will be affected by the airport's expansion. Four Conservative-run local authorities - Windsor and Maidenhead, Richmond, Hillingdon and Wandsworth - together with Greenpeace have formed an alliance and instructed lawyers to prepare a case against the project. A third runway at the west London hub would lead to hundreds of thousands more flights each year. Mr Khan claims the scheme - confirmed last month as the Government's preferred plan for boosting airport capacity in south-east England - will expose an extra 200,000 Londoners to an unacceptable level of noise every day. This includes 124 schools and 43,200 schoolchildren. He warns that aircraft noise could lead to health problems related to stress and sleep disturbance, while children could suffer from reduced reading ability and problems with memory recall. A third runway would also add higher levels of toxic air, he adds. The councils are still considering the exact nature of their challenge. The group worked together in 2010 to win a High Court battle over plans by Gordon Brown's government to expand Heathrow. Mr Khan says TfL is likely to be named as an interested party in the action. If this does happen, the mayor will then take a decision on whether to personally join the legal challenge. He said: "I promised I wouldn't just stand-by and see hundreds of thousands suffer from the additional noise and air pollution that a third runway would cause. "These decisions show that I'm ready to help ensure that this misery isn't inflicted on Londoners. "That's why I've directed TfL to provide their expert advice and assistance to support Hillingdon, Richmond, Wandsworth and Windsor and Maidenhead councils, and Greenpeace as they prepare for a joint legal challenge, and why I will be ready for us to play an active role in the action if required."